For many users, stationary Internet connections are already obsolete. LTE coverage and capacity across multiple locations is so good that successfully replaces the cable link. To access to the network for many devices requires appropriate equipment. 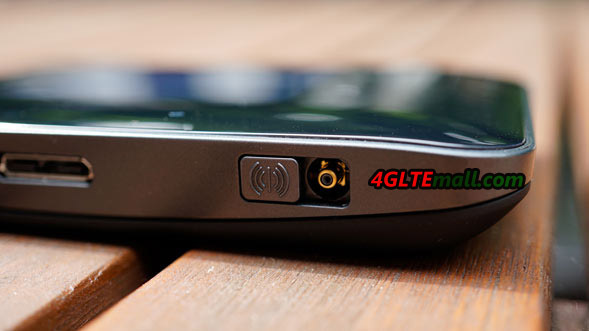 Since LTE routers are already commercially available, simply insert the SIM card and the wireless internet will be available for all devices at home. An alternative to fixed routers for people who appreciate the mobility of access points are portable WiFi Router. 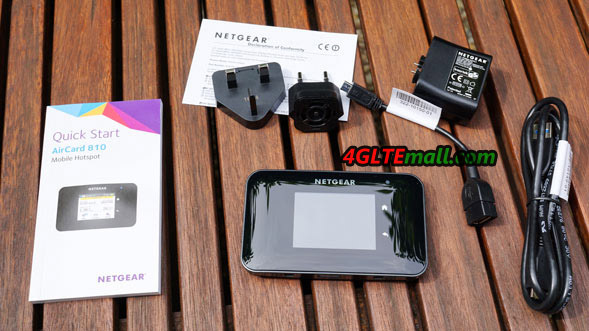 This time, NETGEAR AirCard 810 4G portable router is tested. We checked at home conditions and on the go. Technical specifications of the Aircard 810 indicate that it’s with high-end hardware. Below you will find details. NETGEAR AirCard 810 is a mobile router with the pocket dimensions. It is far smaller than many stationary routers and can easily fits in a pocket, backpack or in the glove compartment in the car. The out body is made of high-quality plastic, and the front lies a 2.44-inch touch screen. 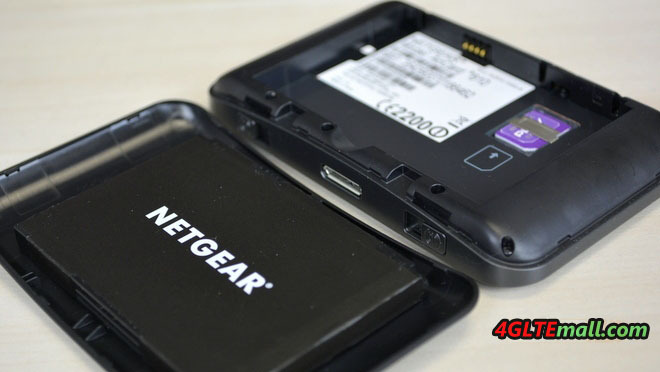 The back cover has the Netgear logo, removing the cover, we can see the battery. Placed on the top edge of the Aircard 810, the power button is responsible for turning on and wake the device. On the opposite side, we find two connectors for external antenna connector and USB port for charging. And the connectors are covered with a sliding lid so there is no fear that this place will be gathered dirt. 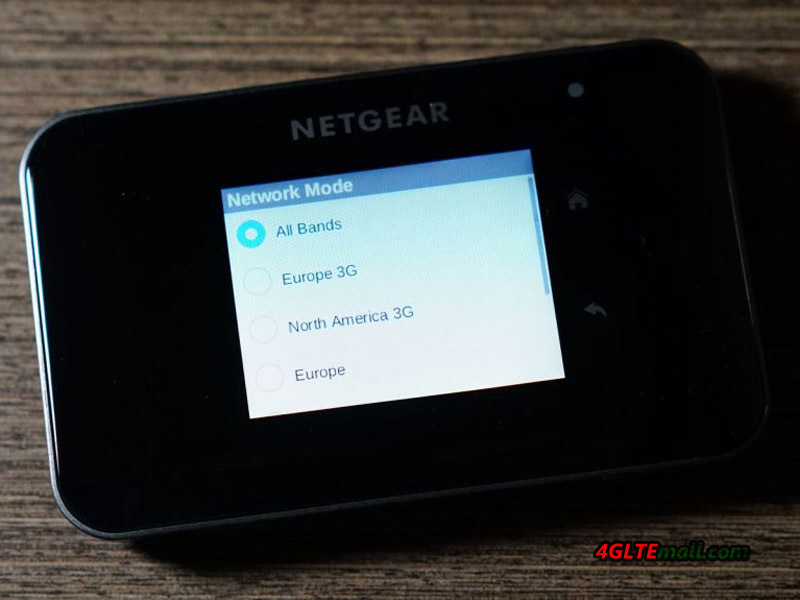 NETGEAR AirCard 810 supports 4G LTE category 11 connectivity and all the most important bands in Europe and Asia. So user can use the unlocked Aircard 810s in all European countries and Aisa areas. It is also important that it supports for LTE FDD band 800, which will provide better coverage in the urban remote areas. The manufacturer provide the Aircard 810s with fast WiFi connectivity, which works in the standard 802.11ac, so provides adequate performance while streaming media and data transfer. 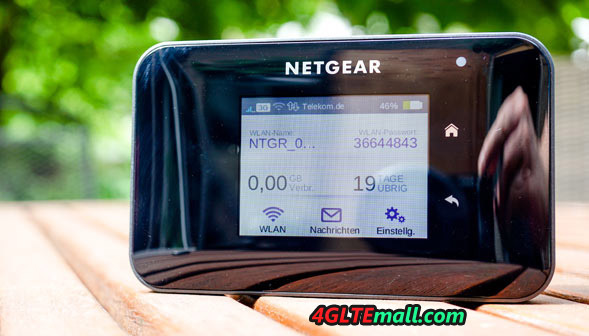 NETGEAR AirCard 810 can operate as a 4G USB modem if you do not want to use Wi-Fi. 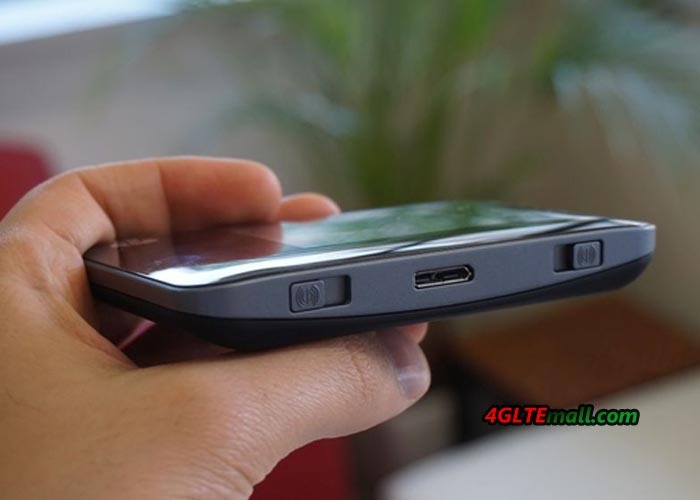 Another interesting feature is the Jump Boost, which allows you to charge smartphones and other small portable devices. The kit has suitable adapter to which we connect any USB cable for charging an external device. A great addition to facilitate the use of the router is the color LCD touch screen. To change the settings or check the current consumption data, no need to open a browser window and log into the control panel. Everything is indicated on the screen in a very accessible way. On the screen you will find information about the battery charge status and range. This of course is not all. The manufacturer has not forgotten to use SMS; users can easily check the card inbox inside the router, you can also write messages using the touch screen. Touch screen performs very well, and the operation does not cause problems. NETGEAR AirCard 810 can be configured using the LCD screen already described. Same configuration is extremely simple and limited to a few steps, so even a person with non-oriented networking technology can operate it. After inserting the SIM card the device is ready for operation. During the tests, the network SIM cards just play and plus do not have to enter data network, and to make any extra settings. After the card is inserted, the Internet was just available. The thing you need to set up is Wi-Fi according to your preferences. By default, the network name and password would be displayed on the screen. After entering the settings, you can change and turn off their visibility. The equipment supports dual-band Wi-Fi (2.4 GHz or 5.0 GHz), and the use of the latter is available only when you turn the corresponding function in the settings. The strength of wireless coverage can be adjusted; we have available three values of the Long Standard. Selected the best possible range, of course, it is associated with shorter battery life. 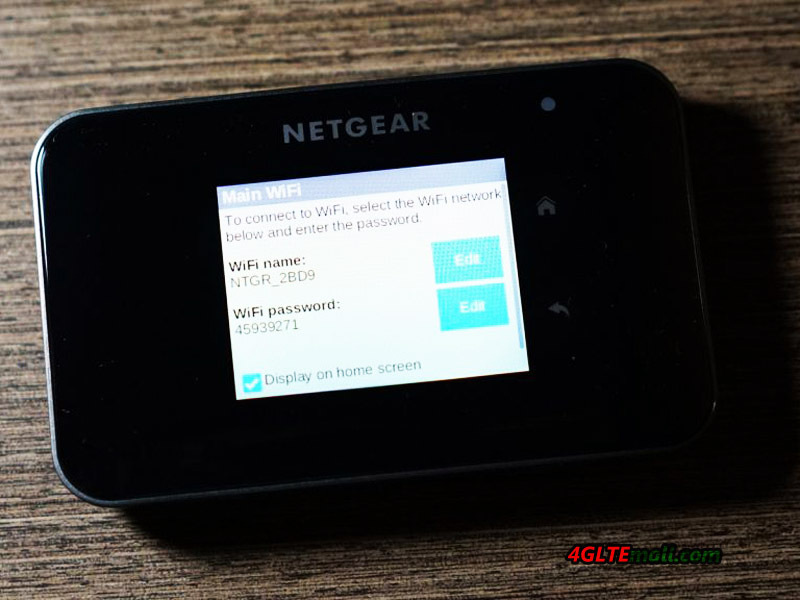 The mobile hotspot can also be possibly operated through a dedicated NETGEAR AirCard APP for Android, iOS and Windows Mobile. Its interface is clear and easy to read, and all settings are available in the APP. With this application in an accessible way, we can customize virtually all device parameters as well as from the touch screen. On the main screen, we see not only the coverage or the status of the battery, but also the consumption of data transfer in the current accounting period and during the current session. We can also see the quantity of the connected devices and send SMS messages. The manufacturer shall ensure that the NETGEAR AirCard 810 can easily handle up to 15 devices connected via Wi-Fi. I could not do the test so heavy load, but when you connect three smartphones, two laptops, TV and console, the aircard 810 can still work properly. You many also not complain about wireless coverage. The router is easily able to cover the range apartment with an area of 80m 2. Built-in battery should provide working time up to 11 hours. With the active Wi-Fi in the 2.4 GHz band and LTE connectivity (full range) easily, I was able to get close to this result and the router work almost 10 hours. The operating time can of course vary depending on usage. It is worth mentioning that offer NETGEAR’s accessories are available for the device under test. 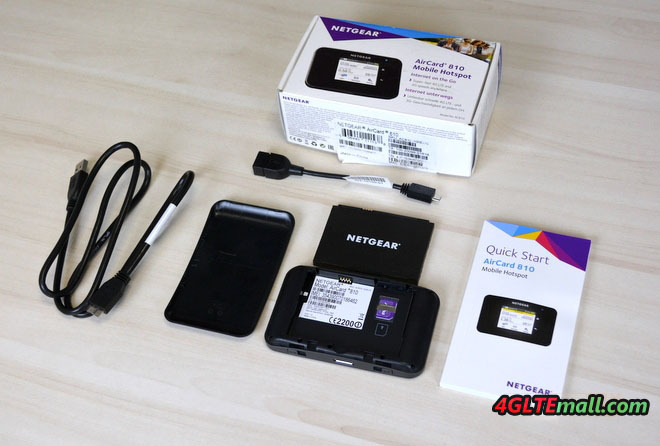 NETGEAR AirCard 810 Mobile hotspot is a device that would useful both at home and on the road if you need wireless network. Inside you will find modern components, which ensure the quality of the connection. It deserves praise with a wide range of supported LTE frequency and dual-band Wi-Fi working in a fast standard AC. The most important is that it’s very easy to use. The router can be controlled via the intuitive display or friendly mobile application. For all the advantages described, unfortunately, you have to pay a lot but considering the capabilities of the device, the price is at high level now. If you need a budget one but good technical specification, the predecessor model Netgear Aircard 790s may be one good option. 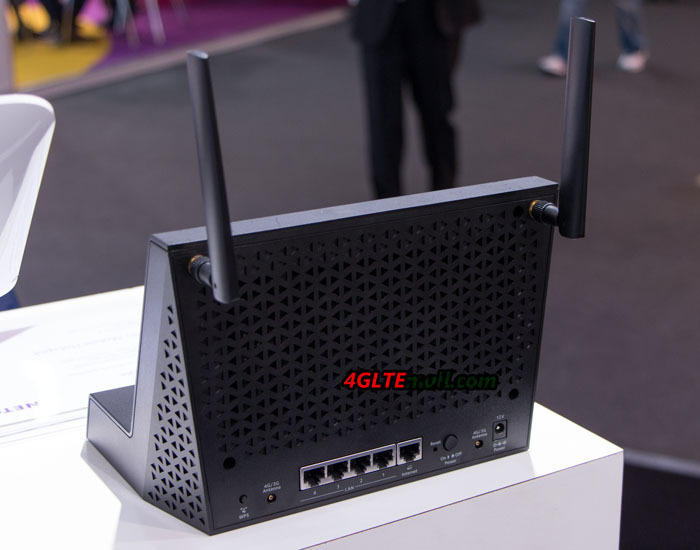 Among the 4G LTE routers and mobile requirement, Netgear offers a new device that meets both mobility and a fixed 4G solution, while supports LTE category 11. In category 11, the maximum theoretical downflow could reach 600 Mbit/s. The AirCard 810 manages the 3-band aggregate to achieve these flow rates. With the band of 700MHz (B28), the aircard 810s could support the LTE Bands in Europe and other areas, and the LTE category 6 (DL 300Mbit/s & UL 50Mb/s) will be well supported for many network operators. 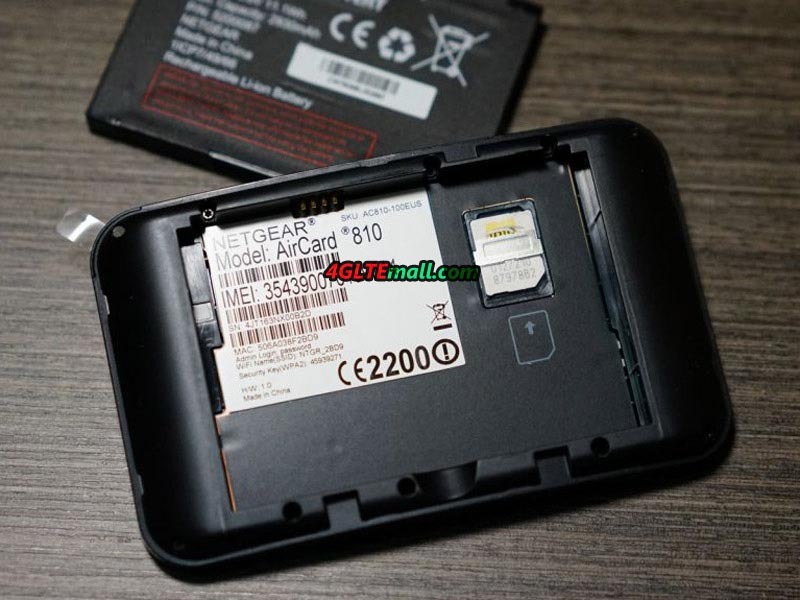 However, the AirCard 810 does not support 2G. The Hot-Spot features a Wi-Fi 802.11ac/b/g/n on 2.4GHz or 5 GHz, 2 × 2 MIMO, and supports multiple SSID and WPS. Interestingly, the 2.4-inch color LCD screen is tactile and allows operation in menus, avoiding the use of a PC or a smartphone to change the settings. 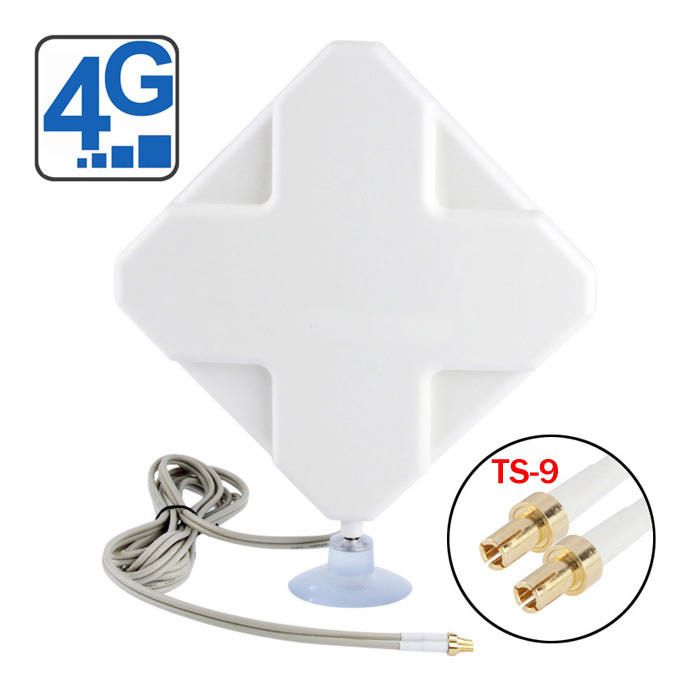 There are dual external antenna connectors in TS9 format, perfect for increasing wireless signal in the countryside. 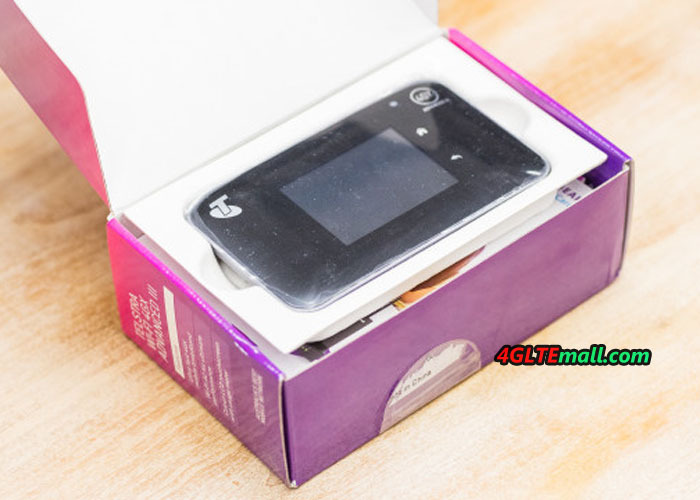 The design is very classic, with removable battery, a mains charger equipped with an adapter “English”. A USB cable allows the device to be charged, while another USB cable (too short) allows it to charge a smartphone from the Hotspot battery. The removable lithium-ion battery of 2930 mAh, allows continuous operation time about ten hours depending on the use and up to 250 hours standby time. 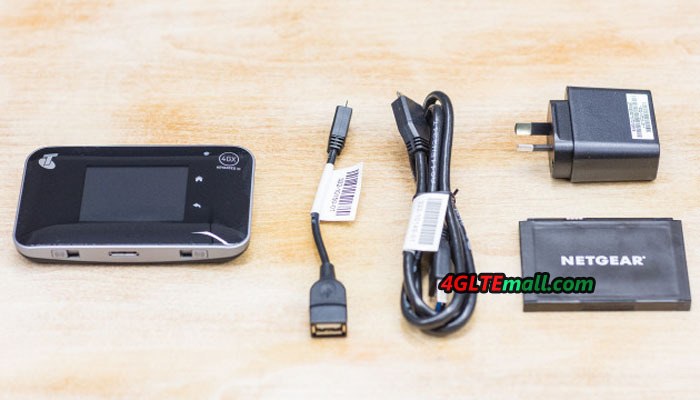 You will find in the functionality of this MiFi router in the web interface, including the network settings, port transfer, DMZ, parental control, QOS etc. What we are interested is in the LAN-WAN extension station for this Netgear WiFi hotspot. The DC112A cradle allows the AirCard 810 hotspot (and other models) to be connected, but it’s not just a docking station. The DC112A station provides few additional functions than predecessor model DC113A. In practice, the DC112A is a real Internet WAN router with all the functions expected on a router, but it hosts the AirCard 810 hotspot via a USB 3.0 connection, to truly mate it to its functions. The DC112A station is equipped with a Gigabit WAN and 4 gigabit LAN ports connection to connect to your Access Point or Boxing as well. It is a router that offers all the usual functionalities (IP V6, DMZ, QOS, port forwarding, DHCP …) and offers WiFi functions 802.11 ac on 2.4 and 5 Ghz, as well as a front USB 3.0 connector allowing sharing of Data, including the Internet. 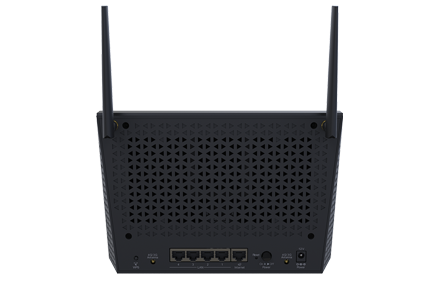 Connectivity is important, the cradle is equipped with 2 large WiFi antennas (SMA format).Two WAN 4G/3G antennas are present inside the unit, allowing greater range and reception for the AC810. The latter can also be replaced by external antennas, since the station also has 2 TS9 sockets for connecting a 4G/3G external antenna with dual connectors. 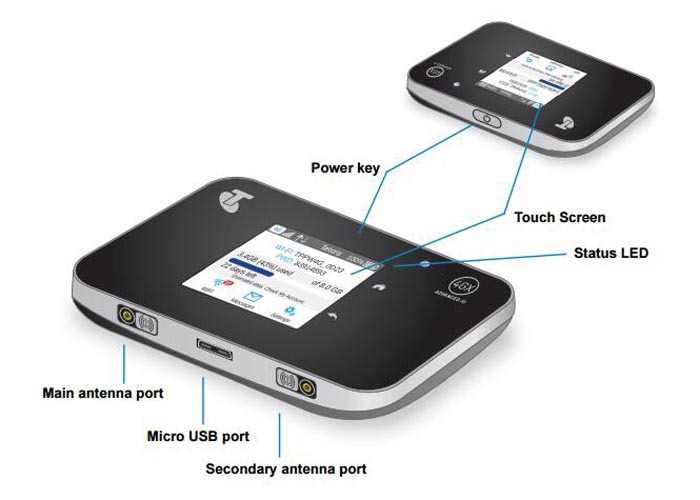 Once the AC810 hotspot is connected to the station, Netgear offers us an operation of the 2 devices “on demand” and offers a configuration between the WAN connection and the 4G data connection. The whole solution therefore offers a mixed WAN-4G solution that provides LTE management with aggregation capable of reaching speeds of 300 Mbit/s to 600 MBit/s downlink depending on the country and the operators that surround you. The whole equipped with connectors of antennas that can meet many needs. Finally, if you go on the move, it is simple to put the hotspot in your pocket, without moving the WAN station, and thus leaving a WAN Internet connection totally available on site. 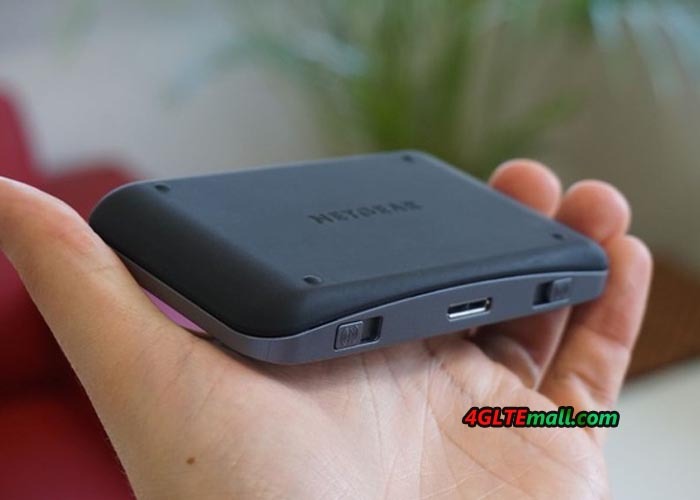 Netgear is known as a leader in the world for mobile connections and has distinguished itself in this field producing various portable 3G/4G devices, which are highly appreciated by users. In the series of wireless aircards, Netgear presented aircard 781s, 782s, 785s, and 790s and the Sierra wireless’s aircard 760s, 762s an 763s. And Netgear doesn’t stop here. New models with upgraded technology become available as time goes. We got the new modem Netgear AirCard 810S for a long time and we present our views today. 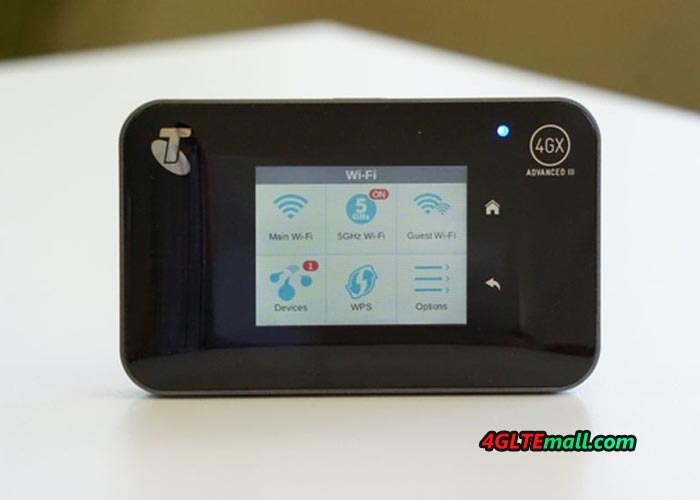 It is a Wi-Fi router with the possibility to use with 3G and 4G by your SIM card (in the format mini). On the top, we find a single physical button to switch on and to awaken the display. Once turned on the front screen you will light up and from there you can manage almost all settings, thanks to a convenient touch panel or the two keys (always touch) present alongside. 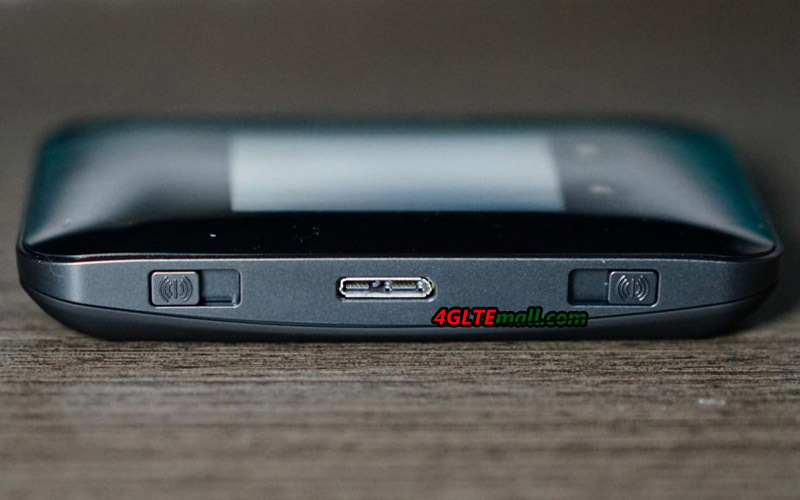 What’s more, the presence of two connections for external antennas and a removable battery (the SIM card holder is located under it) are very useful for users. If the Netgear aircard 810s is working at some places with weak signal, it’s better to connect 4G LTE MIMO antenna with two TS-9 connectors to improve the signal and surfing performance. The removable battery can provide an option for users to use spare battery. Signal reception on both 3G and 4G are excellent for long trips by train, and the signal was stable for a long time. We have many devices connected to our Netgear AC810S router using the password supplied, but it can be changed with ease. The display gives you lot of information simultaneously: the connection status, remaining battery power, the network name, password, data consumed since the last reset of the counters and days remaining to next renewal. After enter in the web interface, we can see three columns: WiFi, Messages and Settings. The first allows us to change the Wi-Fi network settings, such as name, password, or even activate the network in 5 GHz(2.4 GHz as default ) or a network for guests. You can also check which devices are connected. And it also presents WPS and the ability to increase or decrease coverage. The settings for the Aircard 810s portable router can also control the brightness and screen timeout, the network preference, APN, and airplane mode. What most surprised us, however, is the autonomy of this device. With 2-3 connected devices and an normal mobile use, we found a decrease of about 10% battery every hour spent, which is a pretty good result. 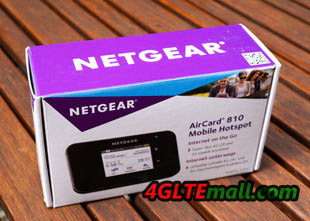 This modem Netgear Aircard 810s, is now available at www.4gltemall.com with unlocked version and various accessories such as external antennas. The price is a little bit high, but it is understandable considering that the aircard 810s as a top range of portable 4G modem. 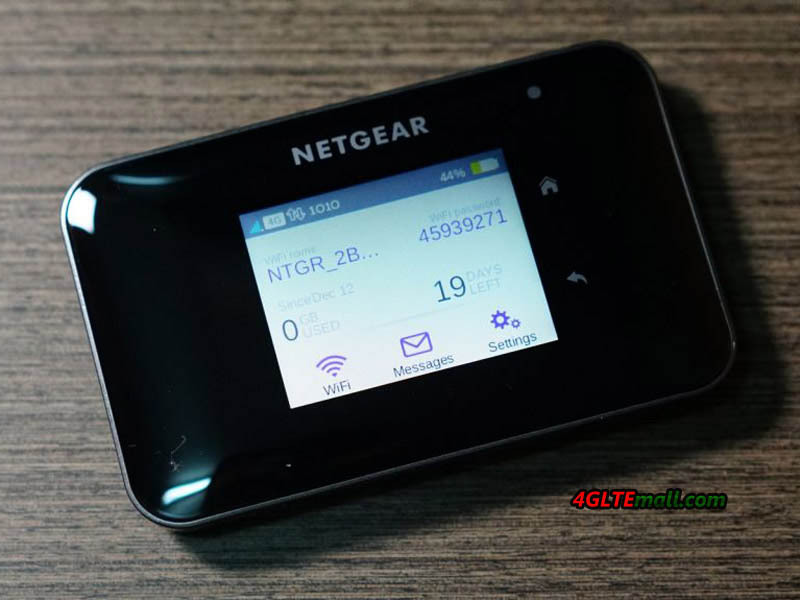 With good battery life, good stability performance, information-rich display and connectors for external antenna, Netgear aircard 810s is still one of the best portable 4G routers. Only the high price and lightweight plastic body are disappointing for potential users. Mobile LTE hotspots are currently very popular and are increasingly replacing LTE sticks: The hotspots offer fast, comfortable internet access and can be used universally with all Wi-Fi enabled devices. The fastest mobile LTE router we has tested is Aircard 790, which have been able to reach around 300 Mbit/s downstream, based on LTE Category 6 technology. 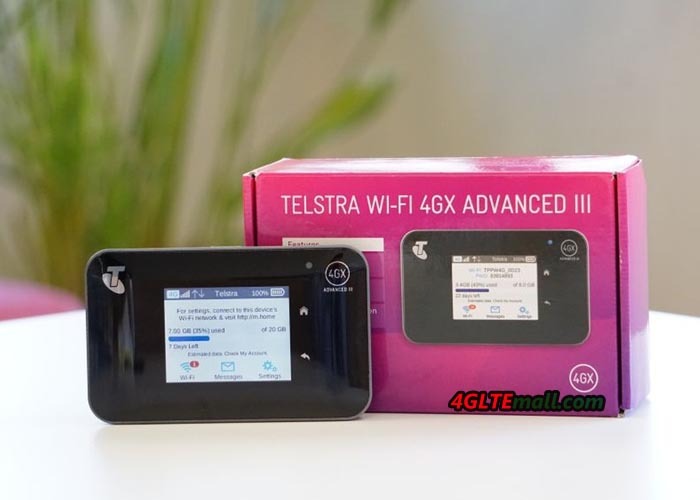 Here we have a new 4G mobile Hotspot announced, which offer significantly faster speeds than Netgear AC790S. Netgear has the AirCard 810 now, which is the world’s first hotspot to allow download up to 600 MBit/s. The Netgear AirCard 810 hotspot has an integrated Qualcomm Snapdragon X12 modem, which supports LTE category 11 with speeds up to 600 Mbit/s downstream and up to 50 Mbit/s upstream. The high data rate is possible by triple channel bonding, up to 60 megahertz radio spectrum, the hotspot simultaneously also use in the downlink. In the test, only 2 x 20 MHz frequency was tested bundling. In the network of Vodafone, the speed could reach around 220 Mbit/s. 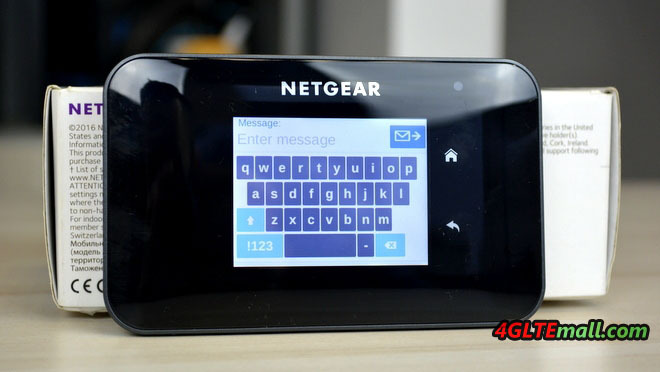 In any case, the Netgear AirCard 810 is equipped for the future of the mobile Internet. In the package box, there is a small Quick Start Guide, a charger, USB Micro-USB port, the lithium-ion battery and AC adapter. 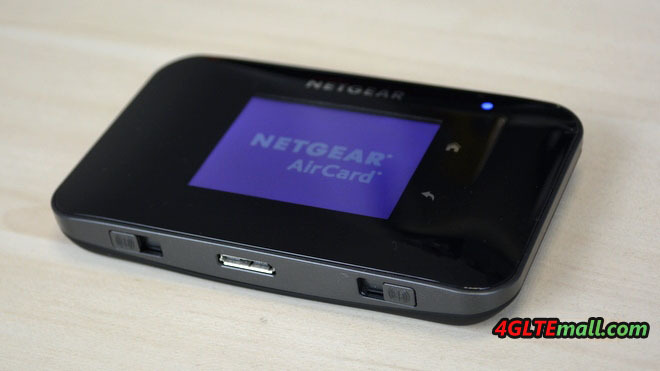 And of course, there is the Netgear Aircard 810 hotspot. 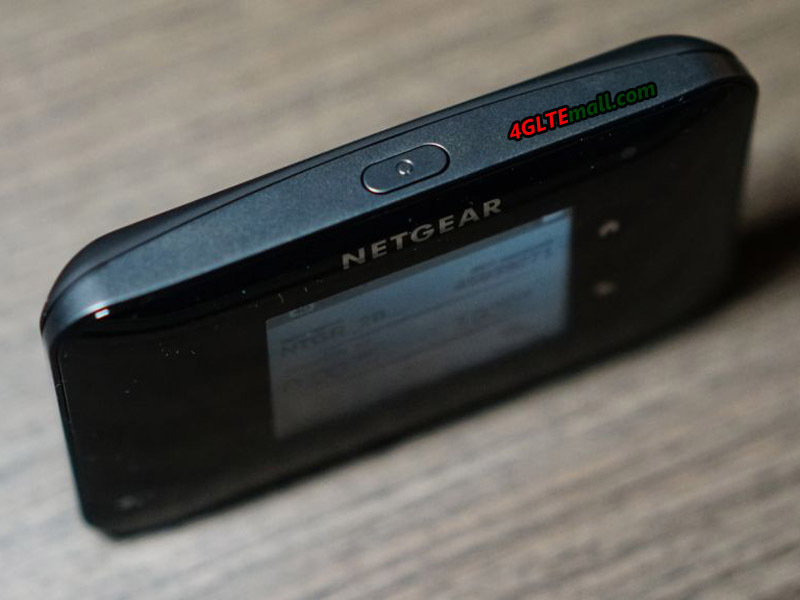 Although Netgear AirCard 810 Hotspot has a very fast LTE modem, but deactivates the GSM function at the same time. The GSM/2G network for mobile surfing is anyway hardly or not suitable, but some users should miss the data services from GPRS and EDGE. 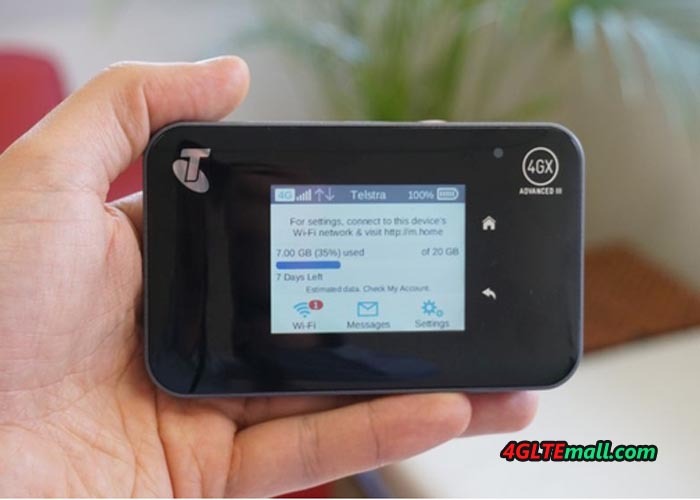 Why Netgear has GSM-disabled is not entirely clear, for most users, the limitation of GSM network is probably due to successful UMTS and LTE network expansion. The Netgear AirCard 810 LTE router is equipped with a 2.4-inch touchscreen display, which will show important information for device status and can be also used for configuration like the predecessor Aircard 790. The display reacts quickly and reliably, and the menu system is easy to understand. Most functions can be selected via the display, only very few settings is needed to do via the web interface, which can be opened from any browser. On the home screen, all the important information such as call duration, data volume and number of wireless users are displayed. On request, the wireless password will be displayed. The display brightness can be adjusted in three stages, as well as the duration of the illumination. Normally the display goes a few seconds after the last touch by itself, to save energy. A bright LED on the front shows the signals and the connection status on the display. Netgear AirCard 810 can provide an Internet connection for up to 15 devices simultaneously via WLAN. Another device can be connected via USB cable. The maximum LTE speed could be gained when connected computer supports USB 3.0. A suitable cable is supplied with the device; this is also used to recharge the battery simultaneously. Netgear 810s uses a wireless modern dual band AC module that can spark both 2.4 GHz and 5 GHz. The maximum speed is fast enough based on WLAN 802.11ac. The wireless transmission power can be controlled in three steps and convinced in the test by a good range. However, External wireless antennas were not connected, so that one is dependent on the integrated antennas in the device. On request, it is open for the user to create a guest Wi-Fi with a separate username and password. Particularly impressive was the wireless repeater function in the test. This allows Internet access over existing wireless networks instead of cellular. 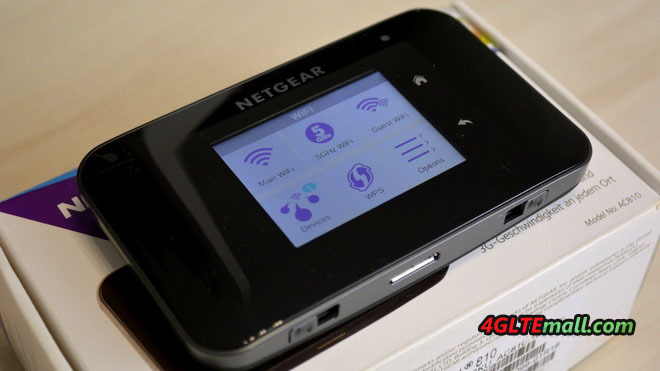 So you can give the Netgear AirCard 810 as the wireless access from home DSL router or the hotel Wi-Fi and soon a known WLAN is within range, it will be used for Internet access. The function is particularly interesting for those users who do not have an unlimited data plan, but must extend the WiFi coverage range. 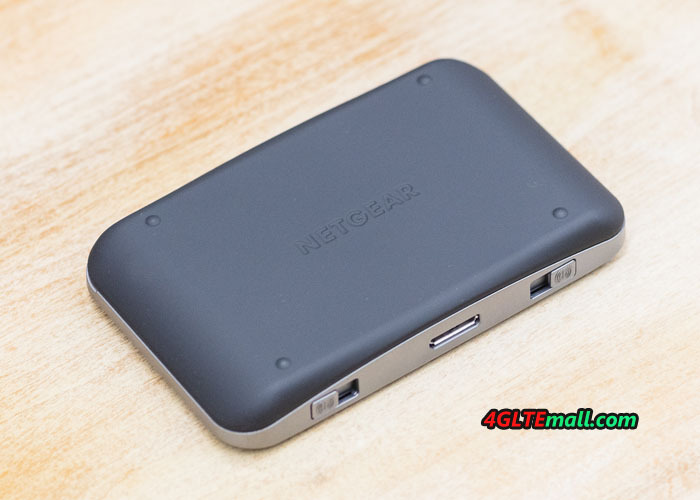 The Netgear AirCard 810 battery is 2,970 mAh strong and provides an operating time of about 11 hours in the LTE network. 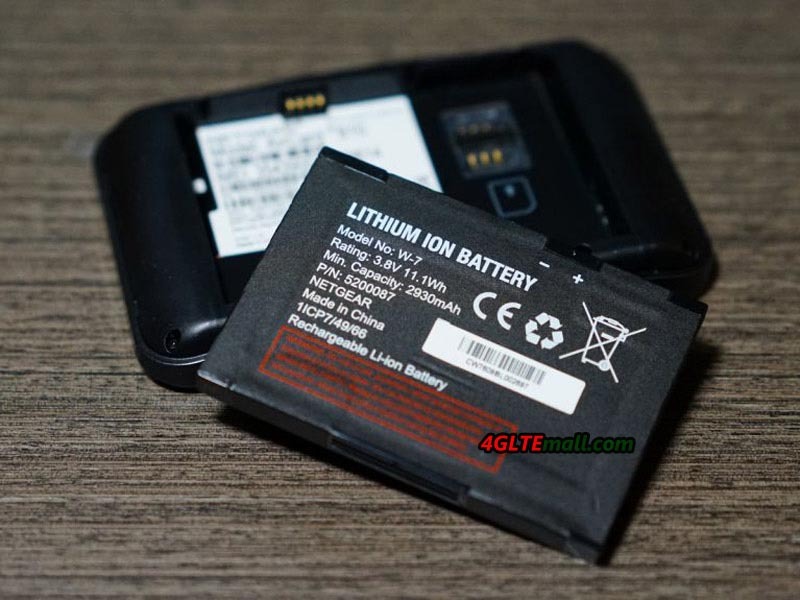 If that is not sufficient, user can easily purchase one or more replacement batteries, because the battery is easily replaceable in seconds, which is a big advantage over many other LTE hotspots with permanently installed batteries. The Netgear AirCard 810 router even allows you to charge other mobile devices with built-in battery and the supplied adapter cable. This “Jump Boost” function allows the rapid reloading of a smartphone. Since the Netgear Aircard 810s is the latest new with the future-proof technology, the price is not cheap now, but considering the performance offered by the device, the aircard 810 is worth the price. Anyone looking for a top current mobile LTE hotspot with fast WLAN and sophisticated touch-screen operation, should not miss AirCard 810. Alternatively, the similar models Netgear Aircard 790s, Huawei E5786 and Huawei E5787 have cheaper price, but offer “only” 300 MBit/s LTE, which could be considered for lower budget. 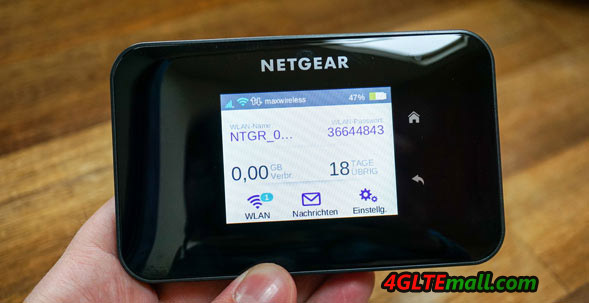 Netgear had been offering 4G mobile LTE hotspots in European countries years ago. The Netgear’s newest mobile wireless router AirCard 810 offers speeds up to 600 Mbit/s over LTE Advanced category 11. Thus, the AirCard 810 Hotspot is by far the world’s fastest LTE router. 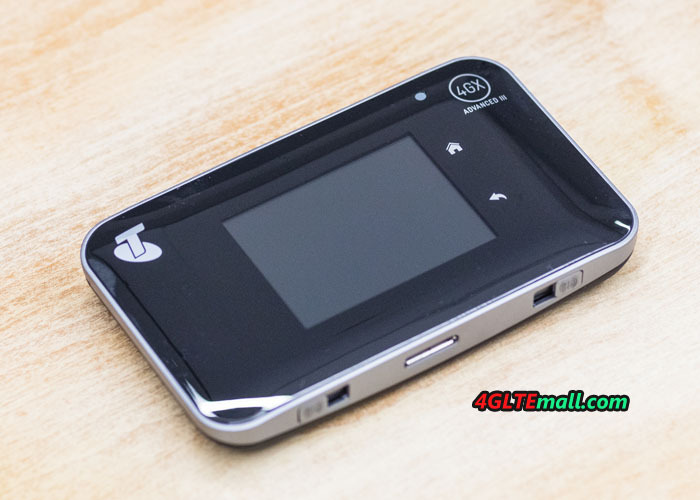 Today, we will have a test for this new mobile hotspot to see the latest feature in this model. The packaging of the Netgear AirCard 810 is not spectacular from the outside. On the small cardboard, there are the most important information such as a brief description of the device and the technical specifications, including supported LTE frequency bands and carrier aggregation band combinations. 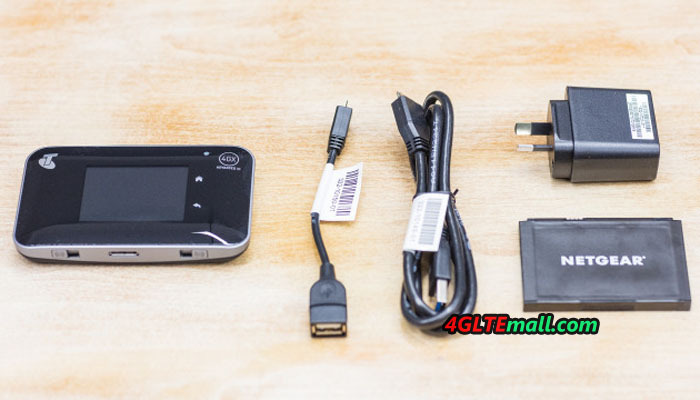 The package contents includes a modular power supply with EU and UK power plug and USB port as well as the 2,930 mAh strong battery, in addition to the hotspot itself. A suitable charging and data cable is of course also available in the box. There is also a small microUSB to USB cable, which allows you to use the Jump Boost technology, so other devices such as smartphones can charge using the hotspots. A special feature included is the printed manual. It explains the functions of the device in different languages. 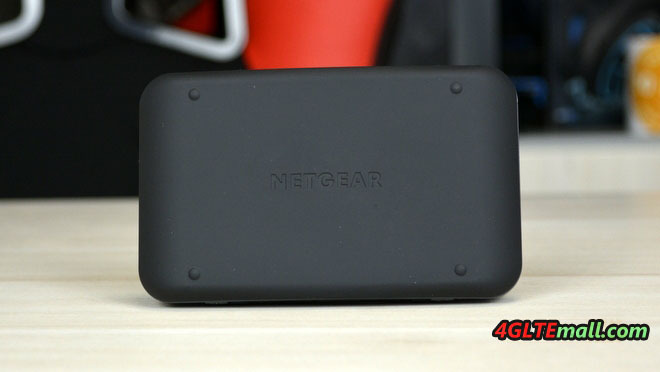 The first impression from Netgear AirCard 810 Hotspot is quite good. The dimensions are 112 x 69 x 15.5 mm pocket-fit and the weight is approximately 132 grams quite low despite the strong battery. The battery cover is secure, but can easily open and feels very good due to the matt black rubber coating. The transparent plastic cover on the front contrast attracts fingerprints magically and reflects quite strong. Also the large color display on the front makes a very good impression, but, there are further more to be excited. LTE Advanced with up to 600 Mbit/s in the downlink – the Netgear AirCard 810 router is the world’s first device that supports LTE such high speeds. Technically, it is LTE Cat11 3 band carrier aggregation (3CA), ie for the full 600 Mbit/s, three 20 MHz wide frequency ranges are combined. However, it is not enough for the Netgear AC810 supports the technology, each provider must have implemented Carrier Aggregation in its network and has sufficient radio spectrum. In the test, the LTE modem made a very good figure by the way. Once you have inserted the MicroSIM card, you don’t need enter the PIN and then the router connects to the wireless network already. Credentials as APN and dial-in number need not be entered, but are automatically selected by the hotspot using the inserted SIM card. The transmission and reception were very good at LTE800 and LTE1800, UMTS was very satisfactory. LTE2600 has not been tested and Netgear has disabled 2G GSM network for unknown reasons. One of the few criticisms of the AC810 relates to the number of supported LTE frequency bands. Although all important FDD-LTE and TDD-LTE frequency bands is supported for Europe, but some important North American frequency bands are missing, so that the Netgear AirCard 810 only conditionally suitable for travel in the Americas. Here one should better check before traveling, which frequency bands are to be used. Netgear sets the WLAN radio module on current dual-band WiFi 802.11 ac, with up to 15 devices can be connected simultaneously. By default, the AirCard 810 sparking in the 2.4GHz band, the 5GHz band can be added when required. The wireless range can be adjusted in the settings in three stages, with a shorter range of battery life benefits. Overall, the wireless coverage was very good in the test – at least for a mobile router. 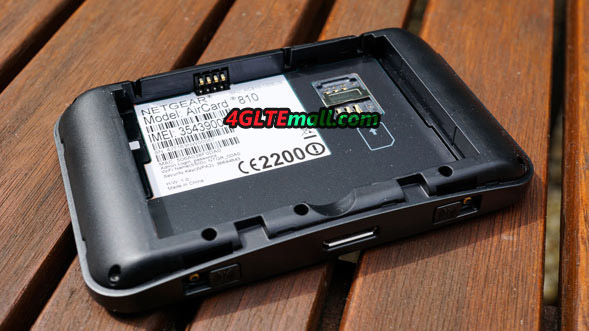 The wireless network is encrypted out, password and WLAN names are printed on a label inside the battery compartment. On request, the password will appear in the display of the router. Optionally, a wireless guest network will be set up with a separate password, the maximum limit of 15 simultaneously permitted devices must also be observed here. 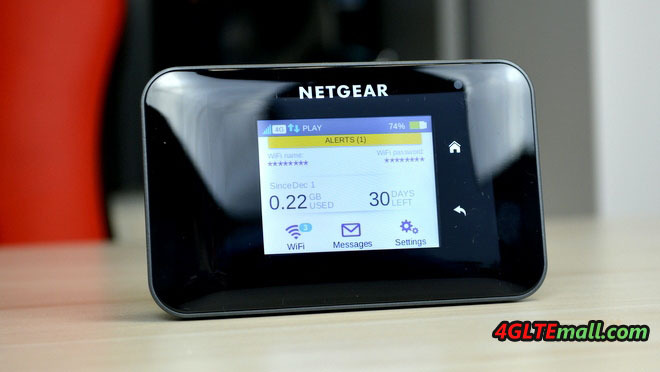 The Netgear AC810 has the so-called “Wi-Fi Offload” feature. This allows the router a wireless network for Internet access instead of using the wireless connection. This saves data volume and can be very useful in many situations. Via the web interface, Netgear AirCard 810 is allowed to use as an access before using the corresponding wireless networks, including password. The function can be found in the router’s wireless menu under “wireless displacement”, said at the unit no configuration is required, but only in principle to turn the function on and off. The wireless connection can take bookings completely switched off and the device can be used as a USB-only modem. This is useful, for example, when you want to use a computer without a WLAN function always on. An operation without the battery, however, is not possible. 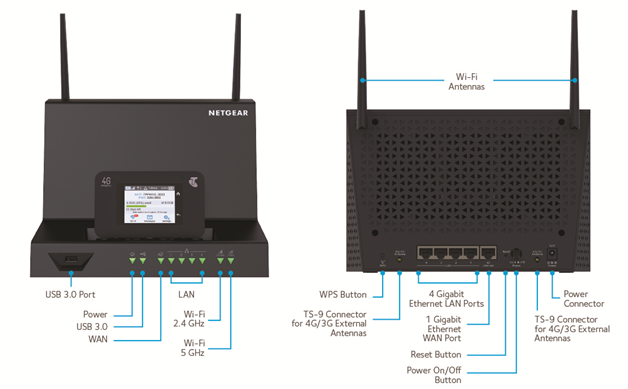 Like its predecessor Netgear Aircard 790, the Netgear AirCard 810 router can be operated and configured in three different ways. The easiest and fastest way is certainly through the touchscreen display directly on the device, but not all functions are available here. Some particularly nested menus are available only via the web interface in a browser. The third way to use is an app for Android and iOS devices. Design and menu structure are managed in all three variants and self-explanatory. The capacitive touch screen on the front reacted very quickly to inputs, write small buttons such as the keyboard for SMS can be operated accurately. Somewhat unreliable were the two capacitive keys for “Home” in the test and “back” of the display. Overall, the touch screen is definitely a nice added value in comparison to other mobile wireless hotspots. The display turns off after a few seconds in order to save energy. This period can be set in the menu. If the display is off, you can read the connection status using a LED above the display according to operational mode in different colors. If desired, the LED is also switched off, which is for example useful if you want to use the hotspot in dark rooms. The Netgear AirCard 810 battery is 2,930 mAh strong and easily replaceable by the user. If necessary, you can just take a second or third battery or replace a defective battery. The manufacturer promises an operating time of about 11 hours, in the test with Internet radio streaming over LTE, I have reached this maturity even approximately. Via the so-called jump-boost function, the battery can charge other devices such as smart phones; the appropriate adapter cable is (as mentioned above) in. But you should not expect too much for recharging multiple times for other devices, if charging is need, we recommends the use of a proper “Power Bank”. The Netgear AirCard 810 allows the option to connect an external LTE antenna to transmit and receive services and to improve the speed. These are two TS-9 connectors in this unit. With a matching Pigtail (adapter) you can connect virtually any standard antenna. Optionally, there Netgear has also a docking station (model DC112A), which remodels the hotspot with 4x Gigabit LAN, external WLAN antennas and integrated charging feature for perfect home router. Unfortunately, the availability of DC112A in my area is very limited, so I unfortunately could not get to test them together. 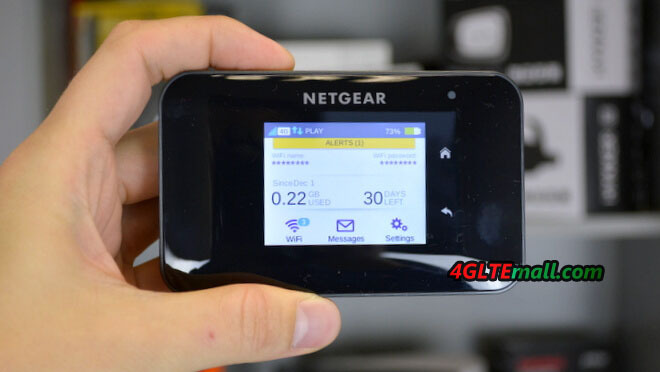 Netgear offers the AirCard 810 LTE Hotspot undoubtedly the best current mobile LTE router in Europe. Not only the modem and the speed of the AirCard 810 are far ahead of its competitors, even the operating concept is outstanding. The very extensive features of the previous generation have been further extended, as is now also a wireless repeater on board. There are still three points which user must note: GSM / 2G mobile is not supported, the manual frequency band selection is not possible and fundamentally supported LTE bands in comparison with current smartphones are still very poor. Overall, the test conclusion is however extremely positive and the Netgear AirCard 810 LTE Hotspot gets a very strong buy recommendation!